The new RotoLock series of adapters from William Optics may well set the "gold' standard for visual backs and eyepiece adapters in the astronomy industry! Thoughtfully designed, exquisitely machined, and artfully presented, these adapters provide a very convenient and robust method to attach eyepieces and accessories to your telescope. Just rotate the golden grip ring clockwise to lock any inserted accessory, or counter-clockwise to release the accessory. Innovative design ensures that you get a very solid hold and the accessory is perfectly centered every time. No thumbscrews to worry about! The internal ball bearings and detents that click every few degrees make this adapter a joy to use. The large, knurled grip ring is easy to grasp with gloves on as well. 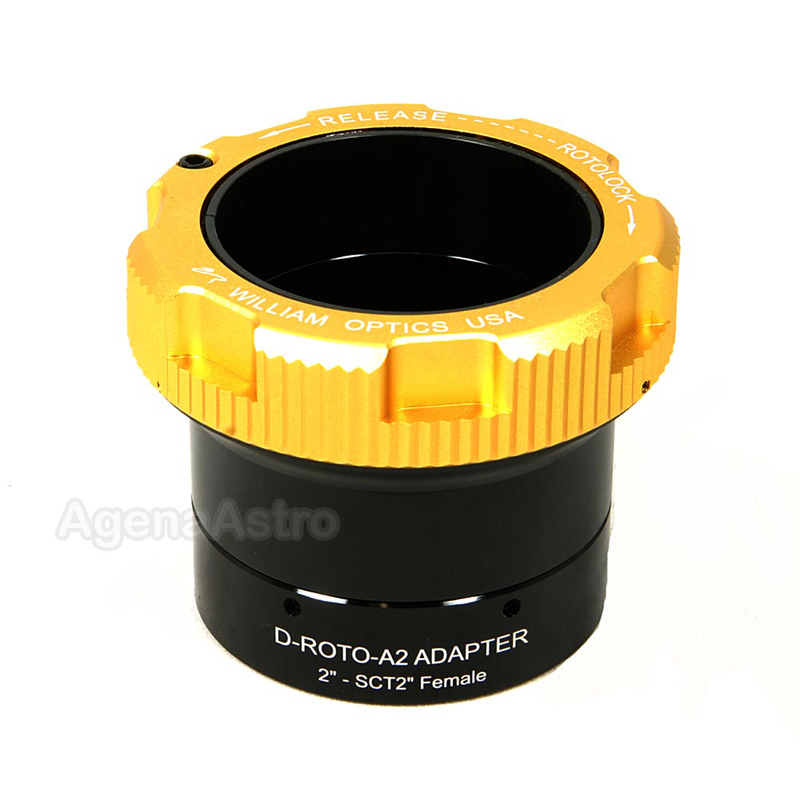 This WO adapter # D-ROTO-A2-SCT2F has a 2" eyepiece holder on one side and a standard 2" SCT female thread (2"x24TPI) on the other side. Owners of all popular SCTs will find the 2" SCT Rotolock visual back to be the perfect way to add 2" capability to their scope. It directly mounts to the 2" SCT male threads on all popular 5 - 9.25" Celestron and Meade SCTs. This was a bit of a splurge item for my C8. I could have gone for a more traditional 2" SCT adapter with a compression ring that is tightened with threaded screws. I have other WO products, and I have been happy with the quality, so I got this...and I am still happy. The only downside is that the rotolock is kind of wide, so if whatever you are putting into it has a thumbscrew (or other projection) the rotolock ring could get in the way. This was an issue for a 2" to 1.25" converter I had sitting around to use my QHY5III-185C. Not a big deal since I could just use a different adapter. My original visual back seized so I couldn't adjust the angle of the diagonal. This device is easy to manipulate and got me back into operation nicely. Excellent piece. Don't know how I did so long without one. Review by rangergeorge of Midland, MI. Works great. I love the way it tightens on my lenses and it looks really cool also. Review by Mark of San Diego, CA. 4.0 Works well, but needed adjustment. This arrived very quickly as have all items I ordered from Agena. The fit and finish is first rate as are all William Optics products. It pretty much works as advertised, but there was a problem with the lower-half of the visual back (the part that screws onto the SCT rear cell) coming loose and spinning freely. The lower part is held in place with a number of small allen screws and they needed tightening. This may present a problem if you don't have the right size tool and also creates a blemish on William Optics quality control. Once tightened the visual back and roto-lock worked as intended.